My shop isn't large enough to rig all the wings at the same time. 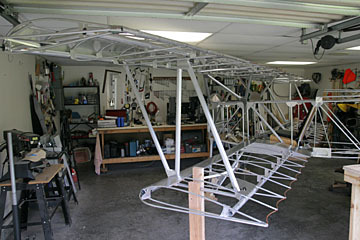 I intend to semi-rig a half at a time and complete the rigging when the plane is at the airport. 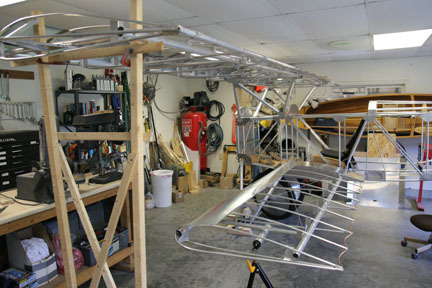 Left wing panels are jigged and ready for fabrication of the aileron and N-strut. It's nice to have a task that goes smoother than expected. 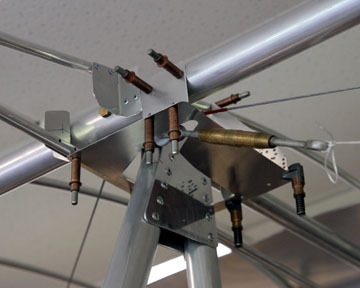 The N-struts are critical in that they play a major role in wing alignment. 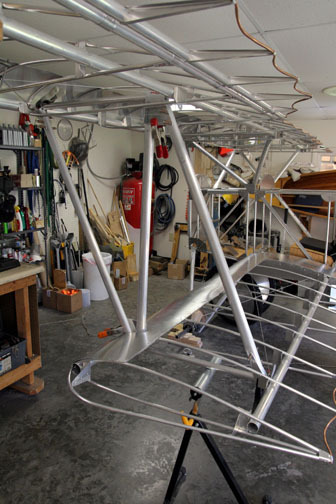 Therefore the wings were carefully leveled and plumbed for zero dihedral, washout, and sweep. And that was the most tedious part of this task. Afterward it was just a matter of cutting tubing to length and adjusting the shape of some of the gussets. The trickiest part was placing the hole where the strut penetrates the leading edge. 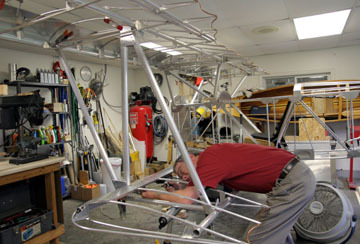 The struts are drilled only for 1/8" clecoes, finish rivets will be deferred until final rigging of the wings. 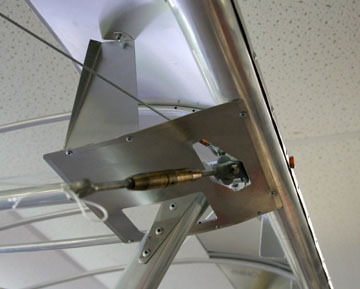 Still needed are access ports in the wings for the bolts that attach the struts to the compression tubes in the wings. The right-hand strut will be built over this one and will go together very quickly because it will be match-drilled to this strut. 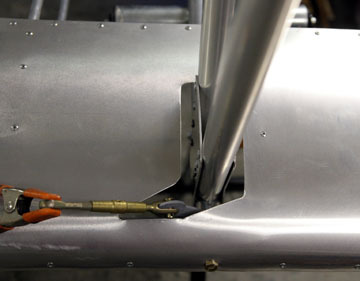 The strut gussets were originally drilled to the tubes with 1/8" clecoes. After verifying everything lined up properly, they were drilled out to 3/16" for finish riveting while on the plane. A 12" bit was invaluable in reaching some of the holes. 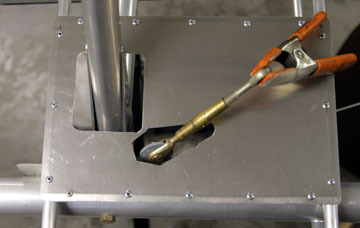 The few holes that couldn't be reached were drilled and riveted after removing the now rigid strut assembly from the plane. This is the cut-out plate at the rear turnbuckle on the lower wing. It is riveted to the ribs and has stiffening angles under the leading and trailing edges. 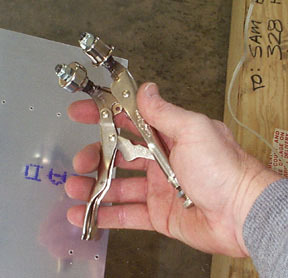 The cut-outs are just large enough to allow the bolt and pin to be worked into place with needle nose pliers. Since I have no intention of dismantling the plane once it is complete this will probably serve as the finished trim on the wing. But...some leather trim might be a good touch. The edges of the panel were finished with an edge forming tool to make them fit nicely under the fabric. The hole in the leading edge is a bit more complex. Here is the surround for the forward flying wire. Surround for aft flying wire and N-strut. 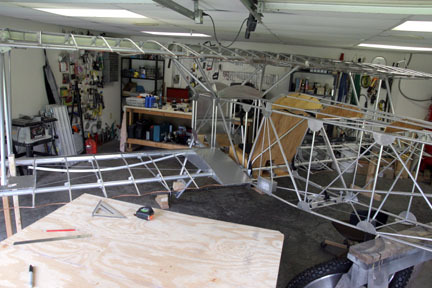 The plan had been to either devote a day outside the shop to rig the plane or take all the pieces to the airport hangar for rigging. I didn't think it would be possible to assemble all the wings in my 24' x 24' shop. This will really make rigging much simpler because there won't be the hassle of moving the plane or rushing though it in one day.